Aside from one small detail, I have Miles' blessing outfit finished. For the most part it is a refashioned outfit. I went to my local thrift store and picked up two white sweaters. The cable knit sweater I picked up for one dollar, and the ribbed knit I had to pay three dollars for. So four dollars of material for the sweater, cap, pants, and booties-Not too bad. I used an existing outfit that we have to create a pattern for the little cardigan and the knit pants. 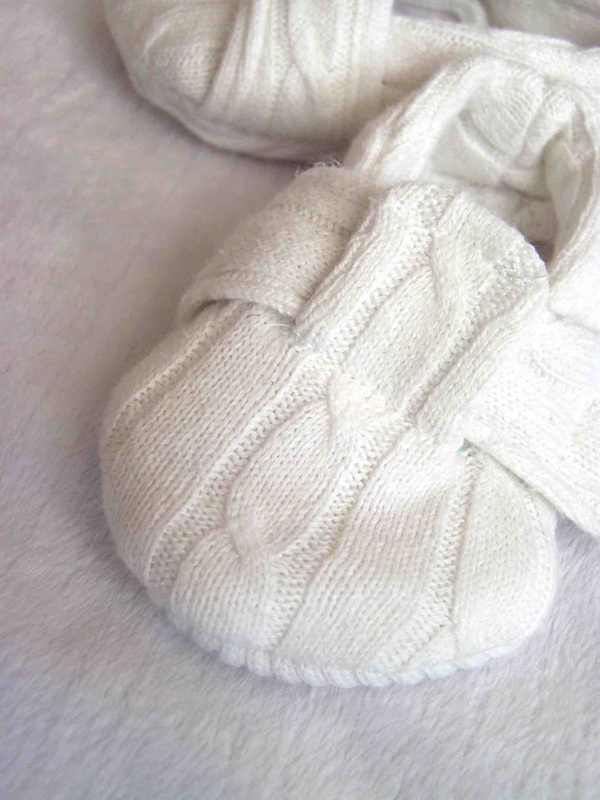 The booties are Sweet Pea Patterns Little London Bootie. The cap was my own design...I almost added a little brim to it, and I'm kind of regretting that I didn't, but he'll look cute in it just the same. I mentioned in a previous post that Miles was going to have a bow tie of his own. 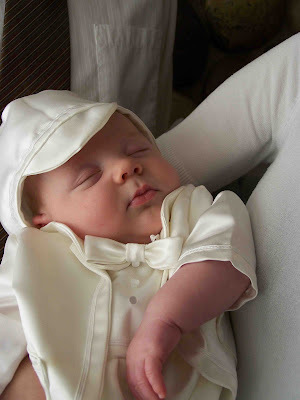 He's going to be matchy matchy with his dad and brother on his blessing day. I know that traditionally blessing outfits are solid white, but I really like the silver, and do you have any idea how difficult it is to find matching shades of white? 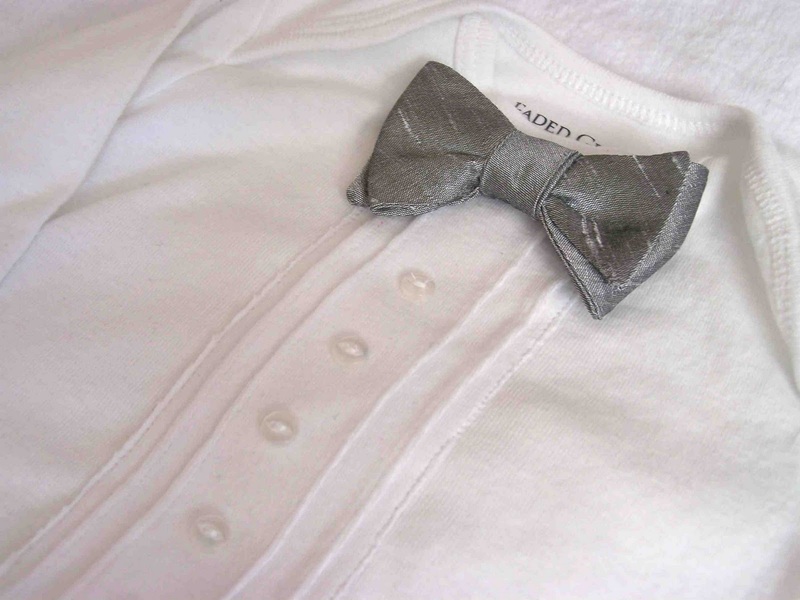 So call me a rebel, but he's going to sport a silver bow tie. I'm kind of in love with the little onesie. I picked up a plain long sleeve onesie at Wal-mart, and added a faux placket. I simply cut a piece of white knit material that was the length of the onesie and three inches wide. I made 1/16" pintucks in half inch increments from the center of the placket. I then applied some fusible adhesive, adhered it to the shirt, and stitched along the edges. I also added four buttons down the front. 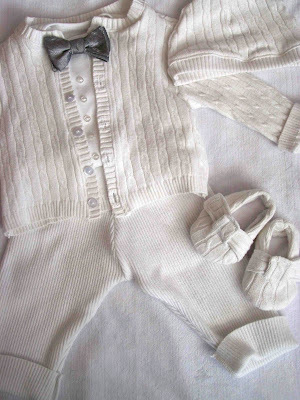 I still plan on embroidering his blessing date on the onesie....any suggestions on the placement? I've been thinking on the hip, but I suppose the back of the neck, or the hem of the sleeve could work as well. What are your thoughts? I know that the outfit isn't as formal as some blessing outfits, but I like that I'm dressing him as a baby boy, and not a full grown man. 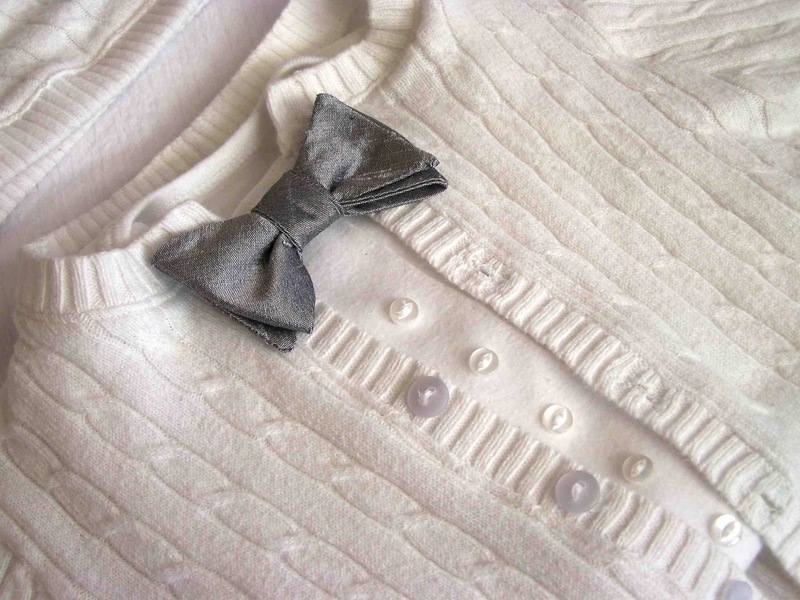 Here's a picture of Clark's blessing outfit. I'll be sure to post some pictures of Miles in his blessing outfit. i think the silver adds a very nice touch. you did an amazing job on the entire outfit and it is leaps and bounds better than the satin jumpers that are so common! Adorable! I love sweet babies all dressed in white. Those booties are adorable! Again i have to ask if you make and sell these or know if Miles' parents wanna sell it? Thanks. I am so in love with this.. I have been searching for an outfit for my son's blessing in December and I can't get my mind off this one... If you'd be willing I'd be willing to pay you for it (& not $30 either). Please please let me know.